Michaelmas, the feast of St. Michael the Archangel, is popular in the United Kingdom and Ireland where it marks the beginning of autumn, because it falls on September 29. In Rome, notwithstanding the fact that St. Michael appeared on the top of Castel Sant'Angelo, Michaelmas is not the occasion for ceremonies of major relevance. 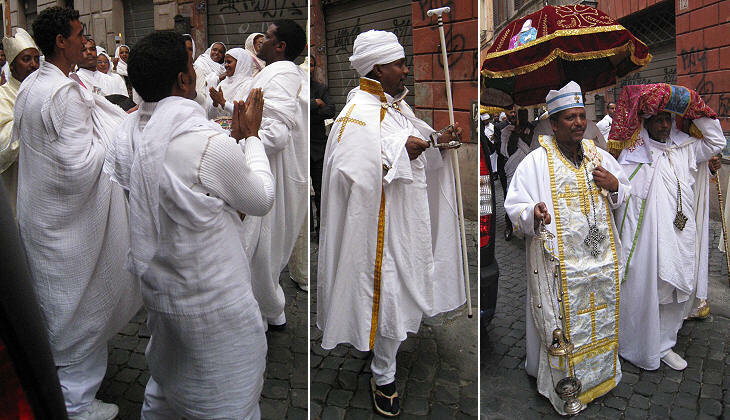 During the last few years the celebrations for Michaelmas in Rome have become more conspicuous owing to the growth of the Eritrean community. 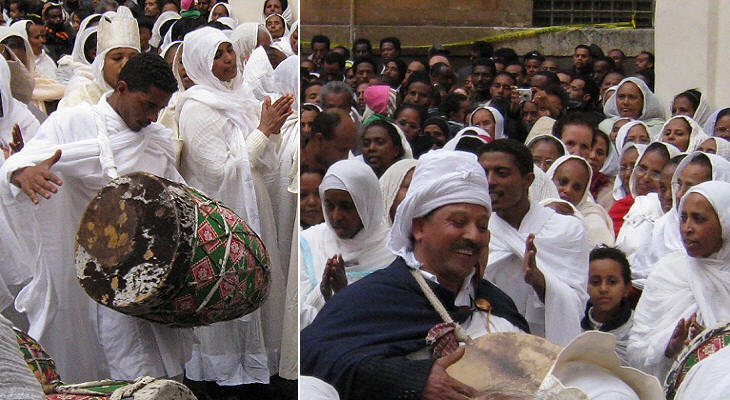 Because the Eritrean National Church (Eritrean Orthodox Tewahedo Church) branched off the Egyptian Coptic Church, it has a different calendar and the feast of St. Michael falls on November 12: in addition this church has not adopted the Gregorian Calendar, so the actual celebration occurs with some delay. The photos of this page were taken on Sunday November 23, 2008. 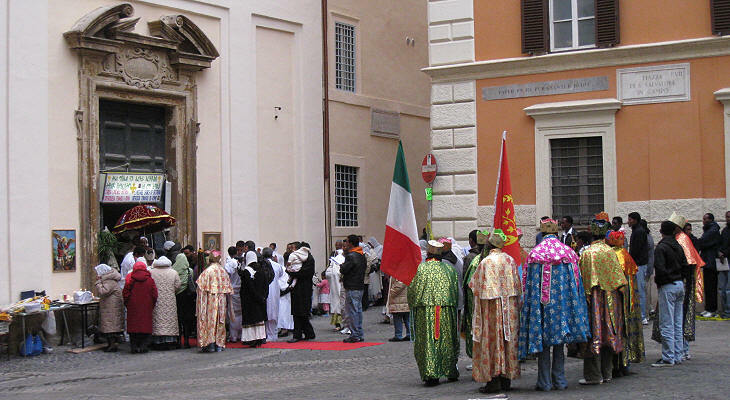 Celebrations took place in the church and square of S. Salvatore in Campo, in the very heart of Rione Regola. They were preceded by a prayer vigil. When the European Powers imposed their rule on many African countries, they regarded the locals as barbarian savages. Italy did this also when in the second half of the XIXth century it occupied the coastal strip along the Red Sea between Sudan (de facto controlled by Britain) and Djibouti (a French colony). In 1890 Italy consolidated its possessions in a colony which was named Eritrea (Red Land in ancient Greek). The inhabitants of the occupied country maybe were poor, but not uncivilized; they had a very complex religious and cultural background; nearly half of them and chiefly those living near the Red Sea were Muslim, while the other half belonged to a Coptic Church which was established in that part of Africa in the IVth century. While in the ceremony held in Rome many sacred images were reproductions of western paintings, a large cross had a peculiar shape which at first sight resembles a key. It derives from the Egyptian cross which in turn was based on the hieroglyphic character ankh (life), which is also known as the key of life or key of the Nile. For the occasion most of the Roman audience wore the national costume (fully or in part) which is based on the use of a white and light cotton fabric. Eritrean Christians leave their shoes outside their churches; it may not be a practice solely derived from contiguity with Muslims, but also an effect of the isolation of this Christian community and of the influence of an old similar Jewish tradition. 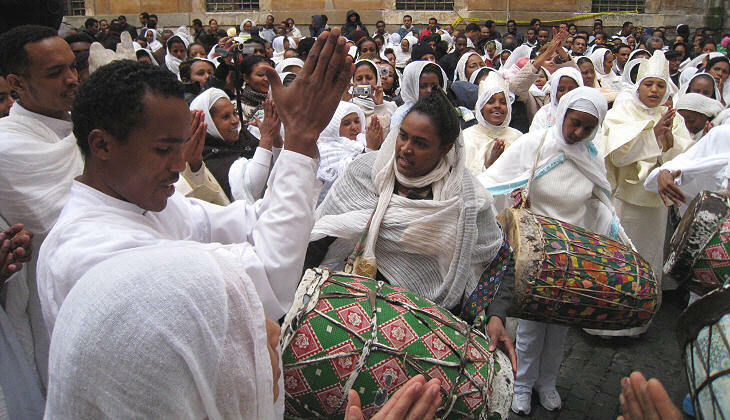 The way Eritrean Christians pray is similar to the Muslim one; rather than joining hands they keep them separate and turn the palms upwards. 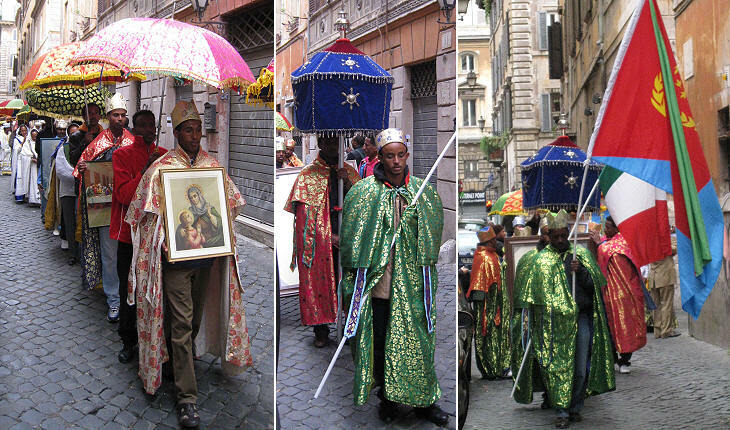 The key moment of the celebration was a (short) procession in the streets around S. Salvatore in Campo; the sacred images were carried with pomp by men dressed as kings who were followed by an attendant holding a brilliantly coloured sunshade. The use of sunshades as a status symbol goes back to the most ancient civilizations: its shape is a reminder of the vault of heaven and a sunshade is among the symbols of the pope. 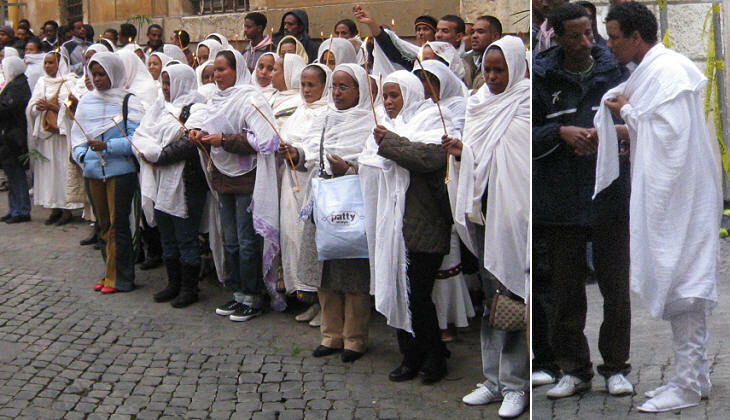 The procession was opened by the Italian and Eritrean flags. Until 1950 the head of the Ethiopian/Eritrean Church was appointed by the Patriarch of Alexandria and usually he was an Egyptian bishop. 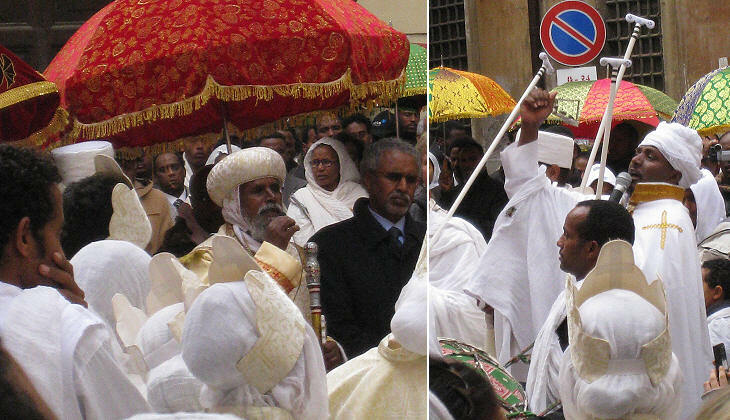 After that year the Ethiopian/Eritrean Church was allowed to choose its own head. In 1993 Eritrea gained independence from Ethiopia (to which it had been federated after WWII) and this led to an autonomous national church. The procession was a joyful affair and the sacred images were followed by a group of musicians and dancers; this is a heritage of an old Jewish tradition of worship dances, as the first Christians in this part of Africa belonged to Hellenized and Jewish communities. Each church has a tabot, or ark of the covenant, which is kept behind a curtain and is covered with silk. For the celebration it was carried by a man above his head. After having completed the procession around the church the audience gathered in the square to listen to a sermon delivered by a religious leader. A number of women wore a cardboard crown and had their hair covered by a white cloth. The ceremony was concluded by a "dance of the sticks": these long sticks derive from those used by the local herdsmen: their flat handle is used for resting during prayer vigils; the sticks are decorated with gold, silver and ivory. Before leaving the ceremony there was time for some more dancing. 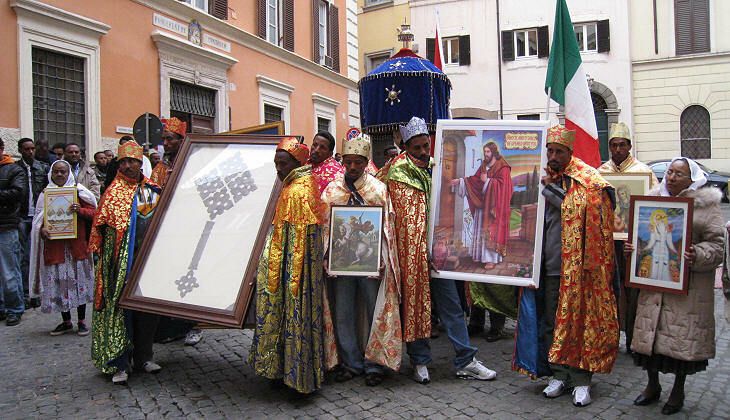 The Eritrean community in Rome is composed of people who have come in recent years: many of them have reached Italy at the end of a dangerous journey through the Libyan desert and across the Mediterranean Sea. In Italy they have to face hostility and to endure exploitation; for a few hours the hardship of their everyday life seemed to vanish in a sort of unaware re-enactment of the Saturnalia, the ancient Roman festival which was marked by a temporary reversal of the social order.